As we enter the summer switch-off in Australia, here’s a different kind of to-do list for the holidays. Nobody wants to be told to relax. It feels counter-intuitive to be instructed to on how to have down-time. But sometimes, in the busy-ness, it can be hard to go from full speed to idle. These 12 prompts are ways of crossing over into the recharge zone. Intended as a gentle thought starter, I created this list in 2010 as a way of giving myself some prompts for downtime and reflection after a particularly challenging year, and finding that I really didn’t know how to switch off. Reflect. Consider the successes and lessons of the year that has passed. Revel. There are many opportunities for celebration. Take them. Share them. Recharge. Chances are, you have worked hard all year. Put some fuel in the tank. Randomise. Disruption is great for creativity. Break habits. Get lost. See what you discover. Reconnect. Connect with the people you wanted to see more of during the year. Regress. Summer is a great time to play. Humans learn from play – it is an ingrained skill we sometimes forget to exercise. Read. For pleasure. There’s no award for the number of business books you consume on holiday. Reframe. We are often in a different place over holidays (even if that different place is ‘home’!) Consider the landscape and allow the different space to inspire new thoughts. Recognise. Notice those things you miss when you are flat out. What would it take to notice them at other times of the year? Record. Keep a holiday journal. Save those insights. Retain. Decide what you want to retain for the year ahead. Hold onto the right things. I’ll be back in the new year with new projects, new collaborations and some other big news! Until then, happy and safe holidays to you and yours. 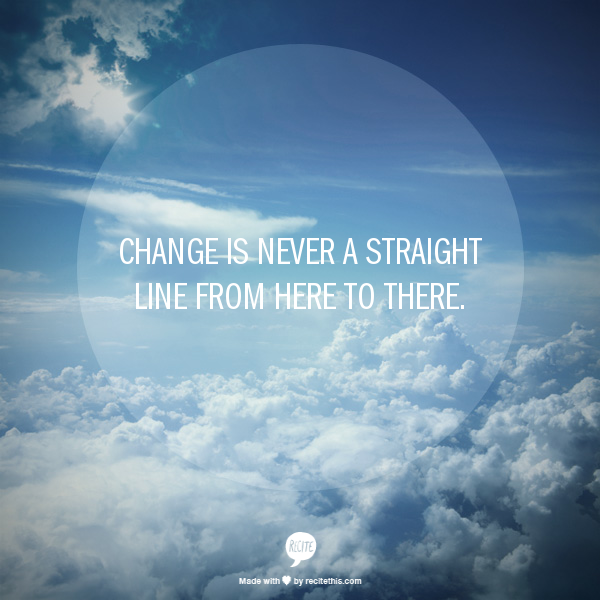 Change is never a straight line. This is a helpful mindset whatever the project you may be working on. Building a case for using video in your organisation is simpler if you follow the 5 P model. Click the image to view the short video on Adobe Voice. To build the case for including video as part of your overall communication infrastructure, cover these five points. Pain. Find the right opportunity that is causing pain: what challenges need attention, what change is under way, what results need to shift? Is the pain at the top, or is it your employees who need help? Partners. Find internal sponsors: who has the greatest stake in addressing this issue? What will they invest to see the situation change? Potential benefit. Put a price on success: What is the value of addressing this issue? Pilot. Before a TV series is made, producers invest in a pilot to test the concept. This is a solid approach for internal video. Start small to test capability, appetite, and audience. What are the major business challenges you are seeking to address through your communication strategy? Don’t limit this to communication challenges. What are the issues that keep the executive team from sleeping well? The most effective communication strategy is linked directly to business outcomes. As with all forms of communication in organisations, new channels and approaches will only be successful if you define clear outcomes. Some communication challenges benefit from the use of video more than others. Identify the changes in awareness, sentiment or behaviour that are required to support this outcome. Face-to-face interaction is an essential component of leadership and engagement. Finding ways to ensure employees hear first hand from leaders and experts is a consistent challenge due to the investment in travel and time. Hearing information from customers or the media before hearing it from within the organisation reduces trust and disengages employees. Many organisations struggle with employees feeling that they are kept informed about things that affect them, a key factor in most engagement studies. Finding ways to share the stories that reinforce the culture, change agenda, key values or operational excellence is an essential way of embedding change. Video provides a platform for doing this in original and engaging ways, providing an immediacy and richness that engages and connects with audiences in ways that other channels struggle to achieve. Collaboration is one of the differentiators for organisations in the fight to be responsive and innovative. Information and experience is sometimes trapped in pockets of the organisation. Providing a means to draw out and share this information creates value. Who can provide support through resources, funding, or expertise to develop the case? Identifying key business issues will mean enlisting partners in the process. Few communicators have deep pockets; most need to find sponsors for new initiatives. In movie-making, a producer is someone with a financial interest in the movie. They are the backer. In corporate communication, whoever stands to gain from the effective use of video as a platform to solve their challenge has the potential to be a ‘producer’ or project sponsor. In addition to internal partners, choosing production partners who will make the most of the available budget and resources is an important decision. Even with the advent of cheap cameras, better bandwidth and simple editing tools, there are some risks with a total DIY approach for an initial project. Video is an emotive medium. People will remember what they see and hear, and if it misses the mark, it can leave a lasting impression for the wrong reason. In the next post, I’ll cover the final 3 Ps in detail.